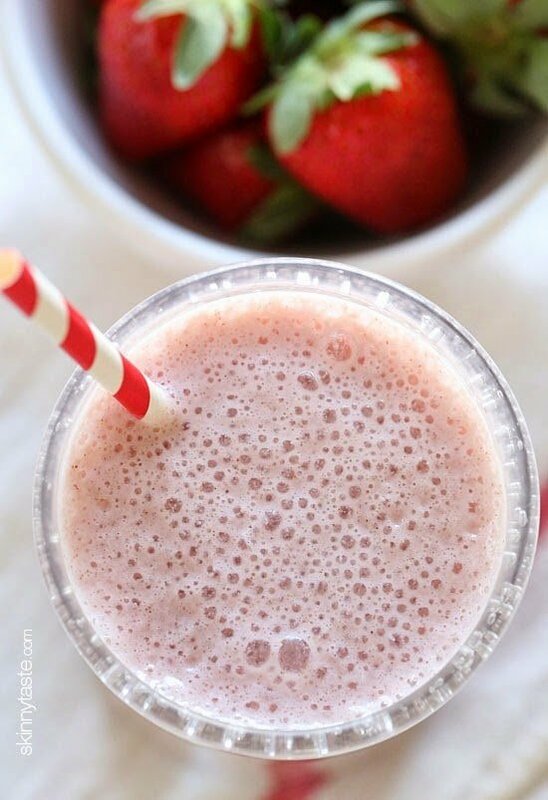 Roasted strawberries in this protein packed smoothie brings out their amazing natural flavor, made with creamy cottage cheese and added chia seeds – what a great way to start the day! I love healthy smoothies to start off my day. A few of my favorites are Chia Watermelon Fresco, Superfood Smoothie (Kale, Banana, Hemp, Chia), and Very Berry Banana Fro-yo Shake. I discovered a new way to add protein to my smoothies… cottage cheese! This is a great discovery for me because I’m not a fan of the tang of yogurt in my smoothies. Cottage cheese makes it creamy with no tang, and has more protein than yogurt so it’s perfect! I also love adding chia seeds to my smoothies which is an excellent source of fiber and omega-3’s which is available at Target. I’m sooo excited to review my new Vitamix blender for the first time. Wow, what power this blender has. And guess what… it’s now available at Target! And Target is giving one away to a lucky winner!! All you have to do is leave a comment here and share your favorite smoothie recipe along with a way I can reach you if you win (email, twitter, Instagram). That’s it, easy!! Good luck!! or another shall be chosen. Good luck! In a medium bowl, combine strawberries and sugar. Pour the strawberries on a parchment paper lined baking sheet. Place in the oven and roast for 12 to 15 minutes until the strawberries start to release their juices but are still firm. Carefully pour the roasted strawberries and their juice into a blender along with cottage cheese, milk, ice and chia and blend until smooth. My favorite smoothie is frozen blueberries, one banana, a tsp of honey, a tbsp of peanut butter and almond milk. 2 cups spinach blended with 2 cups water. When well blended add 1 cup pineapple 1 cup mango and 2 bananas. Any three types of fruit, almond milk, greek yogurt…. spinach, frozen banana, almond milk, flax! Almond milk, Chobani Vanilla greek yogurt, honey, banana, orange, ice, a little bit of vanilla protein powder. It's like a healthy Orange Julius! i'm a simple girl–berries, mango, and some frozen greek yogurt! My go-to smoothie is a Labrada Lean Body Protein Vanilla Milk Shake blended with 4 frozen whole strawberries and 4 fresh whole strawberries. It sets a pleasant tone to the start of my day. Looks delicious! I have heard great things about the Vitamix blender! My favorite is banana, TJ's frozen Very Cherry Berrry Blend, plain greek yogurt, a handful of spinach or baby power greens, chia seeds and unsweetened vanilla almond milk. So yummy! 2 cups blueberries, 1 ripe bannana, 1 1/2 cups Orang juice (not from concentrate) 2tbs raw honey, 1/2 tsp cinnamon, 1/2 vanilla extract (no alcohol). 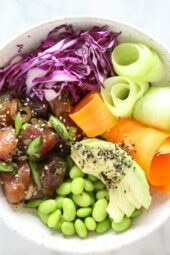 Delish and great pick me up! yum! I love making a smoothie with vanilla greek yogurt, a banana, almond milk, a dallop of peanut butter, some chia seeds, and two cups or so of spinach leaves. Amazing! Spinach, strawberries, pineapple, banana, coconut milk, cinnamon, ice…blend and enjoy! I don't have any smoothie recipes but have heard a lot of good things about the Vitamix. strawberries, bananas, orange juice, spinach and dandelion greens! My favorite smoothie that I have almost every morning includes unsweetened cocoa powder, peanut butter, a banana, milk, and ice cubes. It is so yummy! Kale + banana + frozen berry mix! please email me at [email protected] Thanks so much! I'm simple- I love strawberry, banana and almond butter! throw in some chia seeds too 🙂 contact me on twitter! nicoleby3 thanks! My wife and I love our smoothies, Especially the green ones. We use is as a way to use up extra greens. Fresh pineapple, vanilla protein powder, banana, strawberries and skim milk. Thanks for the opportunity! 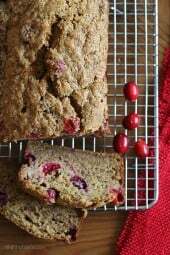 I'm going to try this recipe with some vegan modifications since I can not have dairy. I like almond milk, frozen berries, fage yogurt and a dash of vanilla. Yum. My favorite smoothie is almond milk, protein powder and banana. Sometimes I add some baby spinach. My favorite smoothie recipe as of late is kale, frozen peaches, almond milk, a banana and almond butter. You can find me @cisboomblam on Twitter! I love smoothies! I usually freeze the fruit to give it a thicker texture at the end, instead of using ice which melts quickly. My favorite smoothie recipe is frozen strawberries or mixed berries, lime yogurt, a splash of orange juice. Quick and easy. Banana Blueberry! You cannot go wrong with this combination. I'd patent it if I could! Add in some vanilla protein powder, some cinnamon for circulation, cayenne for metabolism, ginger for digestion, and spinach so you get your greens! Amounts are deliberately vague to accommodate taste and quantities on hand and so you don't have to measure anything before you've had your coffee! 1 cup unsweetened almond milk, 1 cup packed chopped kale, 1/2 cup pineapple juice, 1/2 cup diced pineapple, 1 banana. 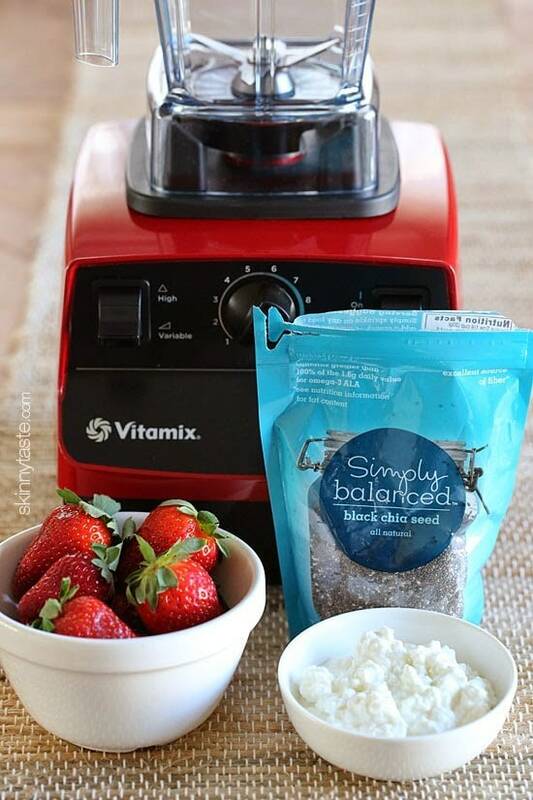 Would LOVE to win the Vitamix! One of my favorite simple smoothie recipes is Almond Milk, Cocao superfood (1 tbsp) and a banana (fresh or frozen). So easy — it's a nice pick me up, and my son loves it! My favorite smoothie is pineapple, banana, spinach, blueberries, and Fage greek yogurt! 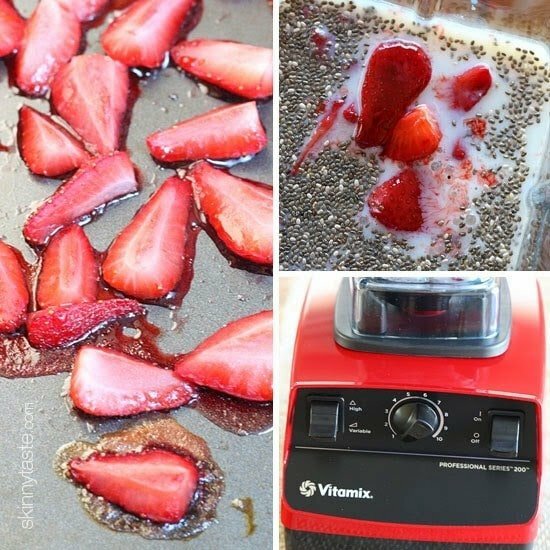 LOVE the idea of roasting the strawberries! I tasted a great smoothie the other day that was being given away as samples. It had banana, spinach, orange, pineapple and lemon and was delicious. I love a smoothie with a 1/2 cup of strawberries, blueberries, some oatmeal, greek yogurt, milk, and 1/2 of a frozen banana. Probably one of the most filling smoothies out there and super delicious. My go-to smoothie recipe is milk, chia seeds, vanilla protein powder, frozen strawberries, half a banana and a splash of OJ! grapes, strawberries, blueberries, banana, scoop of soy yogurt, small handful of ice and half of a container of spinach topped with chia seeds. soooo yummy. My favorite is very simple – coconut milk (since I'm allergic to nuts – so no almond milk for me), a banana and a half teaspoon of powdered peanut butter. Amazing. My work as a Vitamix, but the problem is that I need one for home. My favorite combo is frozen banana, cocoa nibs, almond butter and hemp milk. 1 banana, protein powder, and ice. Thanks for the opportunity! My favorite smoothie is tropical and simple! Almond milk, ice cubes, vanilla protein powder, mango, vanilla yogurt and banana. I actually really like your Avena shake. I only add 1 tbsp of sugar and switch the rest of the sugar for 1-2 tbsp of Hershey's chocolate drink mix. I also add a little vanilla and a little less cinnamon (or sometimes omit it). It's SO good!! coconut water, banana, frozen mango, 1/2 avocado, handful spinach…YUM!! Stonybrook farms non-fat vanilla frozen yogurt, skim milk and nutella! I love smoothies! I have two favorites, the first being mostly fruit and the second being an all-in-one breakfast smoothie. my favorite is Spinach, strawberries, 1/2 banana and pineapple! A handful of kale, 5 cubes of frozen mango, 5 cubes of fresh pineapple, a small banana, 1tbls chia seeds, blend till smooth, you can add coconut water to thin if wanted. I also add fresh ginger to most of my smoothies. Fave smoothie is 1 mango, 1 banana, handful fresh spinach, coconut water, almond milk, hemp powder, 1 avocado. SO GOOD! I've been dreaming for the day I can get a Vitamix, I'm in the kitchen baking, cooking, always trying new recipes! I love adding chia seeds to my smoothies to get the extra Omega – as a vegan, I can't get it via fish oil! 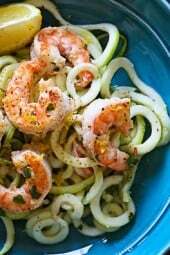 I would love to try this recipe in a new vitamin blender! Mix together until blended and thick. A handful of kale, 5 cubes of frozen mango, 5 cubes of fresh pineapple, a banana, and 1 tbls chia seeds. Blend until smooth. You can also add fresh ginger. I like to add ginger to most of my smoothies, but I love ginger. I'd freak out if I won!! I've wanted one for so long 🙂 Fav smoothie is simple: banana, almond milk, big spoon of almond butter, and chocolate protein powder. Delicious, simple, protein packed. I can be reached at [email protected]. Thanks! My favorite smoothie is a banana peanut butter smoothie: a cup of ice, one banana, 2 tablespoons of peanut butter, 1/4 cup of flax seeds, a dash of honey (depending on how ripe your banana is), and enough milk to get to your desired thickness (about 1/3 cup). It is SO delicious! My favorite smoothie is almond milk, pineapple, banana and blueberries. My favorite recipe is from Skinnytaste, the Skinny Green Monster Smoothie! Frozen banana, greek yogurt, peanut butter, almond milk, spinach leaves, and some ice – yum! I would LOVE a new blender!!! Dissolve Coffee-mate in warm water. Place all of the ingredients in blender, except for the whipped cream. Blend on high speed for 30-45 seconds. Pour, and top with Fat Free Redi-Whip. Strawberrylicious! Sounds gross but it's like a chocolate/peanutbutter/banana milkshake! You can't taste the spinach at all. Coconut milk, frozen berries, protein powder, spinach! I'll make this for breakfast tomorrow! It sounds super yummy. Roasted strawberries sound Devine! I can't wait to try this! 2 cups frozen tart cherries + 2 frozen ripe bananas + 1 cup water + 1 tsp vanilla extract + stevia or other sweetener as needed = pure deliciousness! My go to favorite smoothie is kale, spinach, almond milk, chia seeds, flax seed, frozen wild blueberries, frozen sliced peaches, and half a banana. My favorite is vanilla greek yogurt, frozen berries, and a dap of vanilla protein powder. So simple, soooo good! My favorite smoothie is Dr. Oz's Green Drink! Frozen banana, strawberries, blueberries, 1/3 cup milk, 2 big spoonfuls greek yogurt, chia seeds, and spinach. So yummy!! I've always wanted this blender!!! My favorite smoothie: Frozen strawberries, pineapple, blueberries. Bananas and fresh kale and spinach. Mix in yogurt and OJ. Blend and enjoy! My fav smoothie is: one scoop vanilla protein shake mix, 2tbsp creamy peanut butter, 1/2 cup crushed ice, 1/2 cup skim milk. Blend and enjoy! If i win, please contact me at [email protected] and thank you for this chance! My magic bullet is quickly dying lol!